MOSCOW, ID: About 20 high school teachers and community college instructors from across Idaho and Washington are participating in the Northwest Climate Education Resources workshop this week at the University of Idaho. The workshop is a collaboration of NASA, U.S. Department of Agriculture and National Science Foundation projects that aim to engage teachers in climate change and agricultural education in the hope they will share what they learned with their own students. Teachers began the workshop Tuesday and will continue today and Thursday with lessons and activities about climate change, sustainable farming, developing student experiments and more. 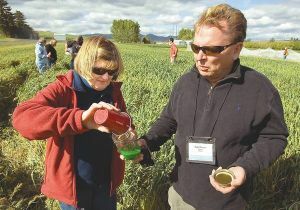 They spent Tuesday afternoon at the Washington State University Cook Agronomy Farm, which studies cereal crops on a large-scale basis outside Pullman, and wrapped up the day at the UI Parker Farm outside Moscow. Jodi Johnson-Maynard, a UI soil scientist and faculty member working on the Regional Approaches to Climate Change in Pacific Northwest Agriculture (REACCH PNA) project, gave teachers a tour of the UI's student-run, mostly organic farm that grows produce. "It's a little bit of a different feel out here than the large scale of the Cook Farm," she said of the approximately 3-acre property. At both farms, teachers collected insects that were trapped in plastic cups placed in holes in the ground. The insects floated in a bright green liquid -- nontoxic antifreeze, said Todd Winters, a teacher from American Falls High School in southeastern Idaho. Winters, who collected specimens with his colleague Mary Roundy, said the teachers intend to compare the insects collected at the Parker Farm, which is smaller and irrigated, with those from the Cook Farm, which is more expansive dryland. "We're going to take what we learn from the experiments back to our students to teach them about climate change," he said. The American Falls teachers are participating in the workshop as part NASA's Intermountain Climate Education Network (ICE Net) project, which is primarily targeted at schools with large Native American student populations. The goal of ICE Net is to help teachers better understand climate change by engaging them in a collaborative process to develop a climate change curriculum, said Anne Kern, an assistant professor of science education at the UI's Coeur d'Alene campus and one of ICE Net's principal investigators. Kern said the ICE Net teachers are learning about place-based science and the cultural components of climate change, which resonates with the Native American students they teach. She said Native Americans have traditionally thought about climate change in a more long-term and location-specific sense than simply assessing each day's weather. This is the second year teachers have been participating in ICE Net, and many of them already saw changes in some of their students this past school year, she said. For example, she said, students paid more attention to the weather, the moon and the folk history behind those aspects of nature. Kern said it's difficult to teach climate change in just one type of K-12 class. Instead, teachers are encouraged to incorporate climate change lessons in as many different subjects as possible. "The hope is they'll feel confident teaching this to their kids," she said. Winters said the transfer of climate change knowledge from experts to teachers and then finally to students is "kind of a trickle-down effect," and one that's an alternative to traditional textbook-based learning. About half of the teachers who visited the farm Tuesday are part of ICE Net, while most of the others are involved in REACCH PNA, which is funded by the USDA's National Institute of Food and Agriculture. 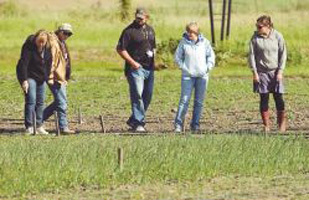 That program involves researchers at Northwest land-grant universities who are aiming to ensure regional agriculture can cope with the effects of climate change. The K-12 teachers participating in the educational component of the project are learning how to incorporate lessons about agriculture into their classrooms. The community college instructors who are participating in the workshop are part of the NSF's Water Resources in a Changing Climate project, a five-year endeavor of the Idaho Experimental Program to Stimulate Competitive Research. The instructors will use what they learn to develop two-hour laboratory lessons for college students. For information about the Northwest Climate Education Resources workshop, visit this link.